I hope everybody is making through this winter so far, the weather been up and down and that is an understatement! There are some fish biting but you just need to go on the right days to catch them. If you’re settled down for the winter and don’t feel like fishing, hit a local or regional fishing school or boat show; you never know what you might learn or see! The Redfishing lately has been pretty good most days when the wind is not howling and we’ve seen some nice schools of Reds. Warmer, sunny and lower wind days can be the key to catching these inshore winter Redfish. It’s not hard to catch them once you find’em, look for these Reds in creek with dark colored bottoms and oyster rocks never hurt. Scented soft plastics like Berkley Gulp should do the trick to get these Reds to hit. Patterns in Gulp like Shrimp in sizes 2” and 3” are my go too, colors that seem to work the best are pearl, molting and new penny. Try lighter jig heads like 1/16 and 1/8 when winter fishing; lighter jig heads help you to work the lure much slower and still look nature as possible. 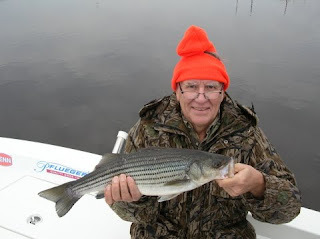 I’ve made quite a few trips to the Cape Fear River year; there are two different kinds of fish to chase in the Cape Fear, Catfish and Striped Bass most all winter long. Here is a few ways to put a CFR Striper on your line. Try Berkley Gulp and Powerbait Jerkshad in 5’ size; in pearl & new penny colors. Work these baits slowly and always rig them weed-less; there are many hangs in the Cape Fear River. Look for Stripers on drop-offs, dock pilings and reed-grass lines. If you would like to give the Catfish a try, use baits like cut mullet, chicken livers and cut eel. I use heavy Carolina rigs when I fish for catfish. Try an Eagle claw L42 2/0 to 4/0 hook with fifty or eighty pound mono leader to make your carolina rig. Look for the catfish on drop-offs from five to twenty feet of water. We have seen some blue cats over thirty pounds caught in the river so try not to use to light of tackle; these are not always your ‘farm pond channel cats’! *If you know any one or your looking for a Bay boat my 2008 Ranger Bay 2200 is for sale please look at this link for all the info on this well maintained Ranger. http://www.boattrader.com/listing/2008-Ranger-2200-Bay-97953352 If you have any questions or would like to see/test drive please let me know. Gear used: Redfish and Striped Bass: reels Penn Conquer 2000 and Battle 2000 & 3000 spinning reels. Catfish Fenwick HMG GS 70MH-MF. Fenwick HMG GS 70M-MF for Redfish and Striped Bass. Line: Spiderwire Ultracast ten and fifth teen pound. Fluorocarbon leader material, Stren Tinted Fluorocarbon in tints Gunsmoke for clearer waters and Tannic for river or stained waters in thirty pound for Redfish and Striped Bass. In other fishing news; it’s boat show and fishing seminar/school season. Here are some of the shows I plan to speck at or appear at. February 4th, 5th and 6th, 2011 - Raleigh Convention Center Boat Show - Raleigh, NC. www.raleighconvention.com/boatshow/ This is a great show with lots of the “top of the line” boats form around the world. I’ll be there with other Ranger Pro’s to show you all the great benefits to the Ranger Saltwater line of boats. February 12th Fisherman’s Post 6th Annual Saltwater Fishing school. www.fishermanspost.com/fishing-school I look forward to this school, I’ve wanted to participate in this school in the past but my winter schedule did not allow me to. I’ve herd many good things about this school in the past. There will be more than twelve local captains at this year school to help you learn all there is to know about any kind of local saltwater fishing. February 19th, 2010-Cape Fear Christian Sportsman Fish Fest. www.capefearsportsmen.org/fishfest This is a great free event! I’ll be speaking on two topics this year; Cape Fear River Striped Bass fishing and my very popular MirrOlures with success seminar. February 25th, 26th and 27th Bass Pro Shop 2011 Spring Fishing Classic, Myrtle Beach, SC. I’ll be answering any questions you have about products made by Penn, Spidwire, Berkley, Fenwick, Minn Kota, MirrOlure and many others you want to purchase at this sale. Bass Pro is also offering there Reel Trade-Ins program for you to save money on your new reels purchased from Bass Pro. Thanks for reading, hope to see you at a boat show or fishing seminar this winter; please come by and say hello.